JD Dodds, NeONBRAND’s very own coding connoisseur works to stay inventive in an industry of the next best thing. Our developer for iPhone Apps and large web applications, JD hasn’t slept a wink in weeks with the development of our latest web application, Grow My Instagram. Grow My Instagram, unlike those cheap, phony baloney instalike and instafollow programs out there, gives users a hands on software that easily connects them to people who match both their specific interests and favorite locations. Plus with an ability to grow your Instagram followers over 300% in the matter of weeks, Grow My Instagram is the latest game changer for Instagram users everywhere. That’s why the NeONBRAND team has been working tirelessly for the last year to develop this software, fixing bugs and debunking codes. When I spoke with JD on the latest additions to the Grow My Instagram project, he had quite a bit to say. What Is Grow My Instagram? JD’s eyes may have been closed, but his brain was alert with deeply engrafted knowledge of the Grow My Instagram software. Without going into the details of the secret sauce, the NeONBRAND team developed a unique software that will give users the edge on accumulating real followers and real likes on Instagram. The best part? Grow My Instagram works automatically, so you don’t have to do anything to make your numbers grow. Once you’ve set up with Grow My Instagram, simply log in to your Instagram account and witness the magic. Demo users report having numerous new likes and follows every time they open the app. JD’s talking about the increasing popularity of Instagram and how businesses and professionals are using the app to cross cultures. If businesses sign up on Grow My Instagram, their exposure rate can increase by over 300%, JD says. What are the Features of Grow My Instagram? When you’re logged into your Grow My Instagram dashboard, access your hashtags list on the left sidebar. Once you click on the hashtag link, you’ll be able to enter hashtags that your Grow My Instagram account will track. You can get crafty or stick to classic hashtags. No matter your decision, this feature is the star of the Grow My Instagram software. Hashtags, as we’ve seen in Instagram and Twitter, is the new language of social media. This means that businesses will be able to connect with potential clients all over the world. You no longer have to check in a location! 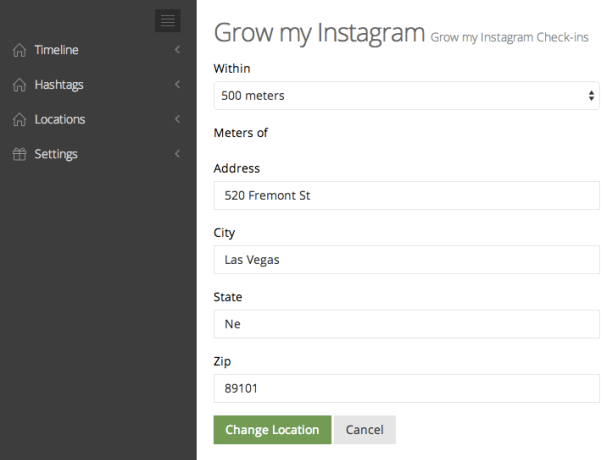 Grow My Instagram’s advanced location monitor will keep a good eye on all your locations for you and make sure to catch anyone checking in the area. For those of us who want to watch the numbers steadily climb and keep and eye on every new like and follow, you can track it on Grow My Instagram. The software also offers a page where you can watch a map of your locations so you can monitor which specific locations are bringing you the most traffic. Pretty cool, huh? Are the Results Really that Impressive? If you don’t think 300% increase in followers is an impressive statistic, then maybe you’re doing something different on Instagram than the rest of us. But JD’s convinced of Grow My Instagram’s ability to strengthen your Instagram presence faster and more efficiently than any other program out there. NeONBRAND founder Kenny Eliason has been trying out the Grow My Instagram project on an artist suffering from muscular dystrophy. Her Instagram, filled with about 7 pictures of her high quality art and drawings, started off at less than 100 followers, with a few likes per photo. After three weeks using Grow My Instgram, her instagram has sky rocketed to over 645 followers, with an average 330 likes per photo. “The effectiveness of this software is outstanding. With rates like these, we definitely have high expectations for Grow My Instagram,” Kenny says. When Can We Expect the Grow My Instagram Release? I certainly can’t wait for the release. Grow My Instagram boasts streamlined auto likes and following that will improve your Instagram experience, giving you the grasp of social media you’ve been looking for. Stay tuned for more information on Grow My Instagram at neonbrand.com. How do you get more followers on Instagram? I’ve been using instagress since it came out. Sounds very similar with a few extra perks. Keep it up. I’d be interested to see it pushed further. Instagress has it’s limitations. I’ll stay tuned.